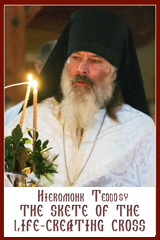 Approximately 60 people were able to join Bishop David Motiuk, Ukrainian Catholic Eparchy of Edmonton, Fr. 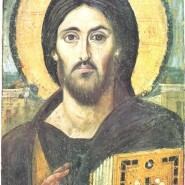 Rendy Yakimec, parish pastor, and Fr. 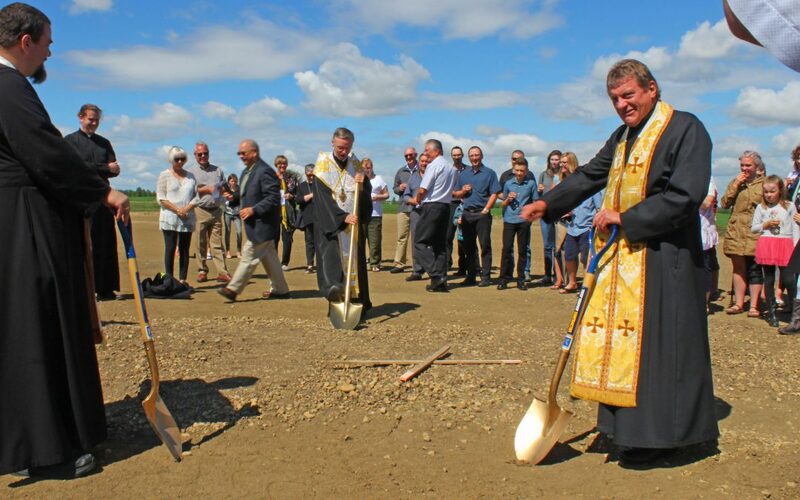 Bohdan Nahachewsky for the sod-turning and blessing of the land on which a new Ukrainian Catholic Church will stand. Bishop David and Father Rendy were surrounded by young and old witnessing our dream and hard work coming to fruition. This truly is a dream of our families for over 15 years now and that is to have a home of our own. Previously we have worshipped in two schools and a funeral home. These were always temporary places based on the kindness of the funeral home and the Elk Island Catholic School system. We were always aware of how circumstances could change for our schools or the funeral home and were always prepared to pack up and move on, having had to do three moves in our 15 years. We’re jumping for joy, now, as the construction on our church begins in two weeks. A favourite quote for me from that day came from one of our youth who was looking forward to being married in our new church, our own home. We have always had to request the kindness of other parishes for our funerals and weddings. As Father Rendy has mentioned, it is not the most appealing thought to be married in a funeral home. We are an active young parish with lots of children. Each Sunday our families have to bring everything out of a storage room to set up, from our altar to our welcoming tables at the entrance. I believe having to work closely together on set-up teams each Sunday with a shared purpose of having a home of our own has brought our families closer. This bond will continue as we have the shared commitment to pay off our load. When my husband and I joined St. Sophia seven years ago attending our first pyrohy-making bee what attracted us to joining was the joy that filled the room with everyone having a future goal of building a church. Through this past few years as our goal has become more of a reality it has been so encouraging to see not only the senior pyrohy-makers, but our young families joining in our fundraising endeavours by organizing a successful golf tournament and liquor raffle. Recently our Knights of Columbus held a spring puschenia (pre-Lenten) dance that was a wonderful success. As a church community in Sherwood Park we have tried to become active members of our Sherwood Park and surrounding communities. Our Outreach program, without our own place, has strived to be active through helping out with the women’s shelter, food bank and other community initiatives. We look forward to our presence as an active member of our Sherwood Park community growing with having our own building to use. A strength for St. Sophia has been our close bond with the Sherwood Park Ukrainian Bilingual Catholic school program. Many of our families have children who support this program as we support their programming. This partnership hopefully will grow as we are able to offer our children and youth more opportunities with having a multi-purpose room. One thought for our future is offering a Ukrainian dancing opportunity at our building. We look forward to holding our first pyrohy supper in our new building in the near future and welcome everyone to come out and taste the tastiest pyrohy in Sherwood Park. And, of course, we need everyone to come out to help pay for our endeavour of building our own home here in Sherwood Park. 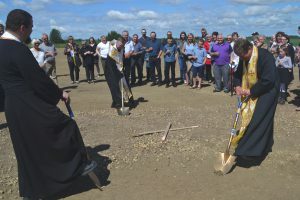 The St. Sophia community looks on at the land-blessing and sod-turning with Bishop David Motiuk, Frs. Rendy Yakimec and Bo Nahachewsky.